Oliver Stone has always fancied himself a revisionist historian, a bold truth-teller speaking facts to power. Unfortunately, so does every conspiracy theorist who’s ever lived. The producer/director has made a career of colorful interpretations of history, but as he’s progressed from his early, all-Vietnam-all-the-time work, to his more exploratory character studies (Nixon, W.), to his recent turn toward documentary work, he’s never varied from a fascination with the hidden, the secretive, and the off-the-record aspects of the politicized past. But if The Putin Interviews, Stone’s new four-part series of conversations with the Russian president, often comes across like the filmmaker’s attempt at making his own version of the Frost-Nixon discussions, it also abandons any attempt at getting a straight answer from him. (Not that Stone himself doesn’t still seem to think this is even more important than that famous work.) And it shows why Stone will mostly continue to disappoint those on all sides of the political spectrum. Stone is a master of the selective deployment of facts, as anyone who’s seen JFK can attest. Sean Wilentz, the left-leaning Princeton historian who reviewed Stone’s 2012 book The Untold History Of The United States for The New York Review Of Books, described Stone as someone who has trouble even framing worthwhile questions about the historical record. “Is there a legitimate argument to be made about the origins of our nuclear diplomacy or the decision to build the H-bomb? Of course there is. But it’s so overloaded with ideological distortion that this question doesn’t get raised in an intelligent way. And once a question gets raised in an unintelligent way, then you are off in cloud-cuckoo land.” (Wilentz’s review was titled “Cherry-Picking Our History.”) The question of how to frame a topic is an important one—it separates A People’s History Of The United States from Loose Change, for starters. And Stone has always been more showman than rigorous academic. He favors the incendiary over the accurate, as any good agent provocateur should. Which is why his new interviews are dispiriting even as they’re informative. Gone is the muckraking spirit of the dramatist intent on upending conventional wisdom—and in his place is a much less interesting figure, one who sacrifices flash for substance, but ends up getting neither. What Stone does get in The Putin Interviews is a portrait of a closely guarded figure, one who reveals much more about himself by what’s left unsaid than in any answer to one of his American interlocutor’s queries. 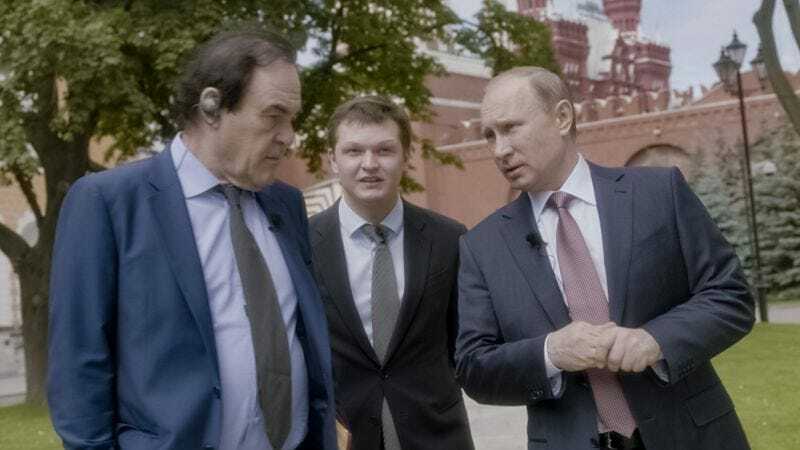 The documentary is a depiction of easily missed cultural disparities, embodied in the buttoned-up former KGB head turned ostensible democratic ruler. Stone includes multiple efforts to humanize this man, asking him about grandchildren, likes and dislikes, if he’s proud of his family. But these receive terse, spare replies. Putin rarely laughs at Stone’s efforts at humor or irony, but he does smile and chuckle at seemingly odd other moments, suggesting a different register for amusement, one not easily translated. In part two, he feeds his horses, and we get a look at a man briefly setting aside his rigor for a small display of affection. Stone, in his ongoing role as sort-of-journalist, is trying for two conflicting things. He wants to be an impassive, Charlie Rose-esque presence that pulls words from Putin and exposes the real person behind the leader, for good and ill. But he also wants to score his usual political points against U.S. foreign policy, the neoconservative movement, and hawkish mentalities, and he doesn’t seem to much care what other political baggage comes along when he finds someone who will back his worldview. Like South Of The Border, his missed opportunity of a documentary about South American leaders, The Putin Interviews are more a chance to show the generic perspectives of a specific nationalist ideology, spouted by its ideologue-in-chief. And on that front, Stone does provide a useful platform for those seeking to better understand the broad array of rationalizations, justifications, and outright fabrications that make up the official government platform of Russia. The best of these come in the form of fundamental attitudes about Russia’s past and its current place in the world, expressed in ways that greatly aid in seeing Putin and his supporters as people with a coherent and humane worldview, even if it’s ultimately as hypocritical as that of any other ends-justify-means thug from the right, left, or center. For example, to Russians, the Cuban missile crisis wasn’t an experience of Russian overreaching, counteracted by U.S. pressure to eventually turn around. To them, as Putin describes it, the Russian effort to place nukes on a Cuban base stemmed from the United States’ prior provocation of putting nukes in Turkey, right by the Russian border. In a Cold War world of bilateral supremacy, there are two sides to every story. But The Putin Interviews are ultimately more evidence the once-fiery director, who can still deliver trashy fun when needed—as in 2012’s hollow-but-entertaining Savages—has become a bore of a political agitprop wannabe, the left-wing version of your grandpa who forwards you news stories about bank robberies foiled by a gun owner, saying, “See? This proves gun control is a bad idea.” Gone is the spark of someone intent on pushing the conversation further. Instead, he just accepts what Putin says when it suits his ends, and when it doesn’t—as in the case of Putin’s openly ignorant and bigoted stance on homosexuality and queerness—Stone barely even elicits enough to let his subject hang himself with his own words. Even the format of the documentary feels weirdly out of time, a relic of an earlier era when a talking head was all you needed to provide your infotainment. There are occasional efforts to produce a more compelling work: inserting TV footage of other world leaders contradicting Putin’s statements; montages of Syria, Ukraine, and other hot-button locales; and the occasional gentle exploration of their surroundings during these talks. But mostly, it’s just Stone and Putin, one drily asking semi-leading questions while the other flatly answers them with mostly predictable results. Again, it works for Charlie Rose and his nightly TV show; for a four-part documentary series Stone’s literally had years to work on, it feels like a tremendously wasted opportunity. But Putin has a bottom-line pragmatism when it comes to his own country’s economy that looks deceptively progressive, because he’s not beholden to special interests. Ergo, he’s done a lot to improve Russia’s jobs situation, tax situation, and largely cleared up much of the calamitous hash Western-inspired deregulation made of the former USSR’s financial system during the ’90s. Any number of topics that are hopelessly deadlocked here, thanks to the privatization funding of our electoral process, are dealt with in more common-sense ways there (aided by an ease with governmental overreach, to be sure). Everyone knows that Wall Street is basically opposed to the interests of the rest of the country, and yet we allow them to buy our elections, by resisting a publicly financed system. The Putin Interviews highlight that glaring flaw. So one of the most powerful foreign leaders is an articulate critic of rotten U.S. foreign policy, our appalling surveillance state, and our thinly veiled imperial ambitions. He’s also a tyrannical autocrat who sheds blood behind closed doors. That’s the conundrum, and it’s one that Oliver Stone fails to convey his awareness of in any way, so enamored is he of this thug who just so happens to oppose Western hypocrisy in the same way Oliver Stone does. It’s why Stone couldn’t answer basic questions from Stephen Colbert about Putin’s many dangerous tendencies. He’s thrown in his lot with a human-rights violator, rather than being open about the knotty contradictions of believing that, yes, it’s important to support those standing up to this government of ours when it’s making a mess of things (and spreading its own media-backed disinformation campaigns—Stone isn’t wrong about that), but still refuse to back down when those same men (it’s almost always men) smile, lie, and abuse the basic rights that make the U.S. such an inspiration in its most abstract form. In sum: Grow up, Oliver Stone. The world needs complex positions, perhaps more than ever in the face of such wanton disregard of them from our highest elected official. It’s important to remind people that there are almost never easy answers to massively complicated and history-laden issues between nations, and certainly not two countries with such a fraught and potentially explosive relationship as that between the U.S. and Russia. We can be thoughtful and critical of our country’s policies while still condemning moral failures on the part of those who seek to challenge those policies on the world stage. This has always been Stone’s problem. He wants the counter-narrative told, but he doesn’t want there to be any problems with it. He just wants something with the force of authority to shatter established narratives in the American media. Someone should tell him those are more effective when they have the ring of truth that comes from admitting no one story is the whole story.